I've lately -- and embarrassingly belatedly -- become hooked on The Voice, NBC's singing show which asks celebrity judges from the music world like Christina Aguilera and Cee Lo Green to pick pop-stars-in-the-making, coach them, and then pick a winner based on watching them compete against one another in "sing offs" in front of a live studio audience, a panel of fellow judges and of course the millions of viewers watching the program at home. The show's been on my radar for a while, and I was finally inspired to check it out when I heard on the radio that The Voice is one of two factors (alongside televised football games) cited as being responsible for pushing NBC's ratings through the roof. The network had been lagging behind all the others for years before The Voice came along. The Voice makes for compelling viewing mostly because of the mostly incredible voices of the singers involved in the show. May favorite performer from the series is Avery Wilson (pictured above), a teenager with an amazingly mellifluous R&B voice and a sweet personality. Plus the guy can move. He just got knocked out of the competition by Cody Belew, whom I don't think has as exceptional a voice or stage presence at all. I think the reason for Wilson's failure can largely be attributed to a poor choice of song (the naff dance hit “Yeah 3x") which didn't show off his abilities to their fullest. Meanwhile Belew did moderately interesting pop-inflected things with Dolly Parton's "Jolene." That was a more inspired choice in terms of creatively showcasing the singer's more modest talents. Now, to get to the meat of this post: there's one issue to do with The Voice that I'm having trouble wrapping my head around. 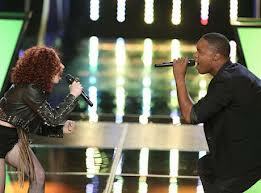 While other vocal music-oriented reality TV shows like The Sing-Off and American Idol judge performers singing separate songs, The Voice pits two singers against each other over the course of a single song. This means that the singers have to perform a duet together while at the same time duel against each other. To me, the tension between having to cooperate and make harmony with someone while wanting to defeat them in that very act is totally bizarre. I can't decide whether there's something intrinsically messed up about the idea or whether it's a stroke of programming genius. Probably a bit of both. It's keeping me watching, anyway.